Last year’s India heatwave officially killed 2,422 people — the country’s highest heat-related death toll in more than two decades. This year, more than 150 deaths in India are blamed on the heat over the past two weeks. “I am afraid the heat will persist and increase for the next weeks and unfortunately the death toll will surely rise,” Herrera told VOA. 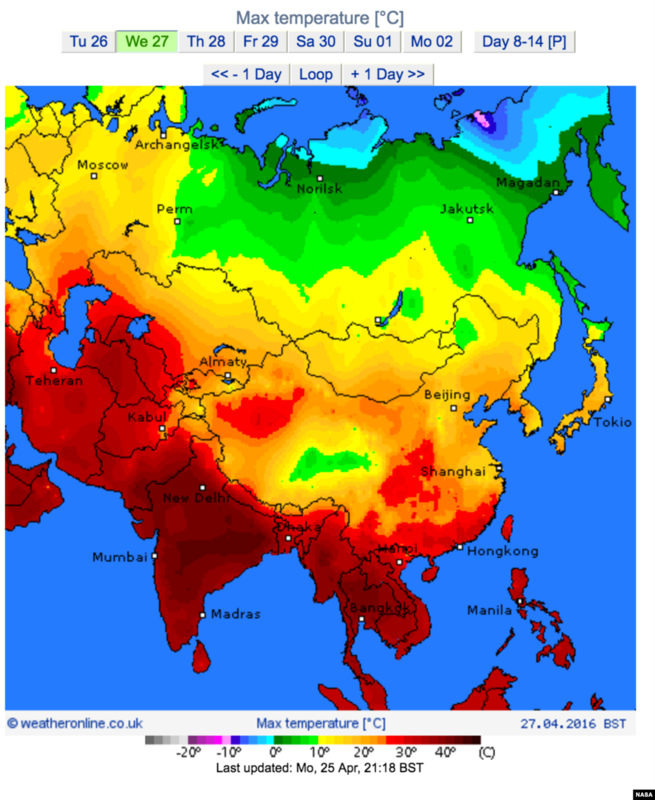 This map from NASA shows land surface temperatures throughout Asia. In India’s richest state of Maharashtra, the worst dry spell in four decades has not only destroyed crops but caused death of livestock, seen reservoirs go dry and affected output at hydroelectric and thermal power plants. In Malaysia, hundreds of schools have been ordered closed and the country’s farmers are losing their vegetables. To the north, in Thailand, a record low rice yield is predicted for the dry season. Vietnam, usually the world’s second biggest coffee exporter, has seen its robusta crop in the central highlands wither amid the worst drought there in at least three decades. The equatorial Pacific Ocean’s climate cycle “El Niño” effect, a warming of sea surface temperatures that occurs every few years, is getting much of the blame for the heat wave and drought. “By suppressing this rising motion in the atmosphere water vapor cannot be carried up in the atmosphere — that’s one reason why the rainfall is suppressed over the Southeast Asia region during the El Niño event,” explained Jin-Yi Yu, professor in the earth system science department at the University of California, Irvine. “What we know right now is that the El Niño is decreasing in intensity. It’s going to go away in a few months,” Yu told VOA, adding, however, that does not mean quick relief is in sight amid the lingering effects of an ever-warmer Indian Ocean climate. But an eventual respite is in the seasonal forecasts. “Most of them are actually forecasting a fairly rapid transition to La Niña conditions over the next few months,” said Blair Trewin, lead author of the World Meteorological Organization’s Five Year Climate Statement (2011-2015). La Niña describes the cooling of surface ocean waters. “La Niña conditions are normally associated with above average rainfall in many parts of South and Southeast Asia,” Trewin, in Melbourne, Australia, told VOA. While South Asia has seen such pre-monsoon season heat waves previously, on an annual basis “the hot days are increasing,” scientist Dilip Kothawale at the Indian Institute of Tropical Meteorology, the lead author on two scientific papers on the subject, told VOA. “The first three months of this year have been so warm that 2016 is almost certain to be the hottest on record,” predicts the Times of India. Some scientists remain cautious about attributing partial blame to climate change for the current spike in temperatures, as the time frame represents a relatively limited chunk of data. 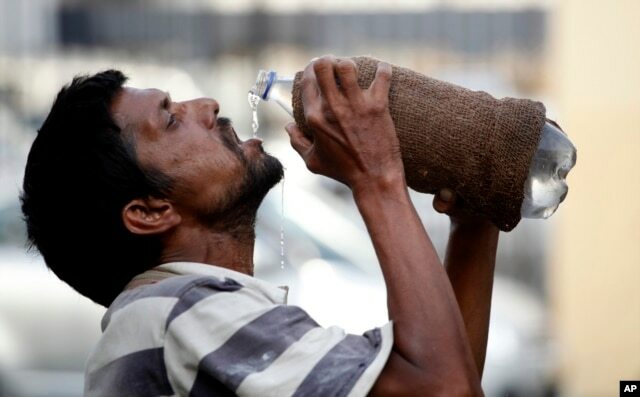 FILE – An Indian drinks water from a bottle on a hot summer day in Allahabad, India. And just how hot is it? Titlagarh in the Indian state of Odisha sizzled at 48.5°C on April 24 — the highest reliably measured temperature for the country in any April. Schools in Odisha were unexpectedly let out for the summer on Tuesday. Classes will remain suspended until, at least, the third week of July. Cambodia saw a national all-time record high of 42.6°C set in Preah Vihea province on April 15. That was two days after its neighbor to the north, Laos, set its own national all-time high temperature of 42.3°C at Seno. Dozens of Thai weather stations have broken or tied their all-time record maximum temperatures this month. The thermometer has been reaching 46.0°C in several towns in Myanmar, still shy of the national record high of 47.2°C at Myinmu observed on May 14, 2010. The UV index, indicating the intensity of sunburn-producing ultraviolet radiation, was at 12 in Bangkok, Manila and Mumbai over several days this week — above the highest “extreme” level threshold of 11.